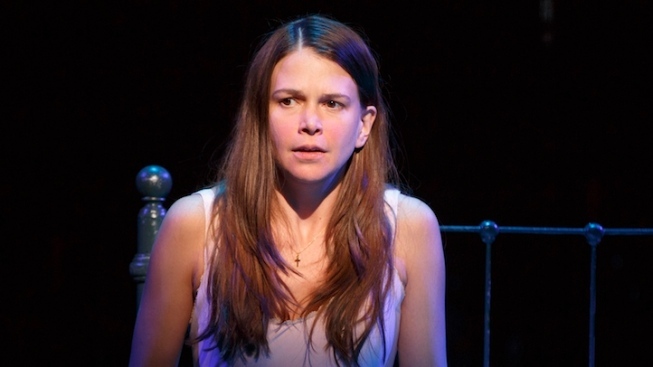 Sutton Foster stars in the Roundabout Theatre Company's "Violet," now open at the American Airlines Theatre. Those expecting to see Sutton Foster belting and tap-dancing her way through her latest Broadway leading-role should be warned: the 39-year-old actress, who won Tonys for her turns in “Thoroughly Modern Millie” and “Anything Goes,” provides a restrained, intricate performance in “Violet,” the Jeanine Tesori-Brian Crawley musical now open at the American Airlines Theatre. It’s a startling turn from the Foster we’re used to seeing, but one that will transfix you all the same. Stripped of any glitzy costumes, wigs or makeup, Foster stands on stage in a plain sundress, her hair uncombed and pushed behind her ears, and breaths life into a complicated, flawed, hopeful character. You’ll feel as though you’re witnessing a star being reborn, 18 years into her career. Foster stars as Violet, a stubborn young woman on a quest for personal healing. Violet was 13 when a rogue ax blade struck her in the face. The accident has left her with a ragged scar across her cheek and nose, and 12 years of being bullied and stared at has turned Violet into a shameful, angry and defensive person. Violet’s walls are so high, you’d need a crane to get over them. We never do see the scar across Violet’s face, but there’s never a moment where Foster lets us forget about the pain it causes Violet. But within that pain is a beam of hope in the form of a televangelist (Ben Davis, of “A Little Night Music”) who Violet naïvely believes will make her “pretty.” So she travels via Greyhound Bus from North Carolina to Oklahoma to see him. And along the way meets two soldiers, Flint and Monty (Joshua Henry and Colin Donnell, respectively), catalysts for more internal, authentic healing. After all, like any Oz-like pilgrimage, life’s more about what you learn on the journey than at the destination. Set in 1964 and inspired by Doris Betts' short story "The Ugliest Pilgrim,” “Violet” premiered at Playwrights Horizons in 1997. It was revived in 2013 for a one-night only concert version for City Center Encores! Off-Center series, directed by Leigh Silverman and starring Foster. The Roundabout Theatre Company brings us this “Violet” (her first trip to Broadway), with Silverman again directing and much of the Encores! cast intact. It’s hard to believe “Violet” was Tesori’s first musical, as her score is rich with complex melodies and delicate themes. A blend of country, gospel, blues and bluegrass, Tesori’s music pay tribute to the best of the American roots. Crawley’s lyrics are pure poetry, utilizing the plain-spoken language of the time to create beautiful illustrations of the difference between perception and reality. If you've seen a Tesori show before, you'll know she's fond of constructing songs performed by multiple actors playing the same character at different ages. It's a device she used in the song "I Know It's Today" in "Shrek the Musical" and in the entirety of "Fun Home." In "Violet," she repeats the trick (or, originates it, as it were). Scenes between a young Violet (Emerson Steele, in a strong Broadway debut) and her father (Alexander Gemignani, “Assassins”) are interjected throughout, to give context to some of Violet’s childhood pain. But we really understand Violet’s pain through her interactions with Flint, who as an African-American is is well aware of what it feels like to be unfairly judged for one’s appearance. Joshua Henry is electric as Flint. In one of the show’s standout numbers, Henry sings "Let It Sing" from the depth of his soul, as if this song was born out of the actor's own personal struggle. His voice will bring chills up and down your spine. Henry was a standout in 2010’s "The Scottsboro Boys,” earning a Tony nomination, and it's hard to imagine he won't find similar acclaim here. Colin Donnell’s Monty also allows us to see sides of Violet we hadn’t expected. Callous at first, once Monty begins to drop his guard, so does Violet, leading to her most tender moment in the show, the sweet lullaby “Lay Down Your Head.” Bravo to Donnell, Foster’s former “Anything Goes” co-star, for giving Monty the sincerity and affection we needed to see through the cockiness. For Broadway, book writer Crawley has cut “Violet” from a two-act play into a one-act. At nearly two hours without intermission, Foster never leaves the stage. This is Violet’s story, and Violet wouldn’t dare let anyone else tell it. Which is good, because you'll fall in love with Foster so wholeheartedly, you won't want her to leave anytime soon. “Violet” through Aug. 10 at the American Airlines Theatre, 227 W. 42nd St. Tickets: $67-$142. Call 212-719-1300 or visit www.roundabouttheatre.org for tickets.